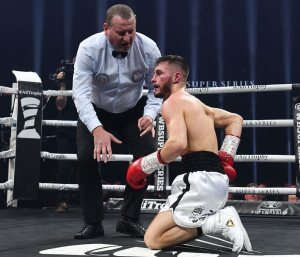 Ryan Burnett, whom Nonito Donaire dethroned of his WBA Super world bantamweight title, suffered a back injury while fighting as an amateur boxer. The injury kept him out of boxing for about a year in his senior years in the amateurs. When he decided to turn professional, Burnett was not able to get medical clearance immediately because of aneurism. In an interview with Box Nation, Burnett told this story: "Shortly after (the World Youth championships) I picked up a back injury which kept me out for about a year, so I never really accomplished much as a senior. In my last amateur bout I lost to (Olympic bronze, European silver and Commonwealth gold medallist) Michael Conlan by just a point in the Irish seniors." With his defeat in the senior amateurs, Burnett applied to become a professional: "During my time out, I started to think about the pro game and how my style might be better suited to it. It is proper fighting. I loved the thought of cracking people with the little leather gloves! You nearly never made it into the pros!" He added that it took him too long to secure a pro boxing license: "When I went for my scan with the Boxing Board they identified an aneurism. The docs told me it was too dangerous for me to box and I'd never fight again. We contested it and it took a year and a half to sort but eventually I was licensed." Burnett was not able to answer the bell for the fifth round in his title fight with Donaire and he received medical treatment in the ring before leaving the SSE Hydro carried on a stretcher. He is scheduled to return to Belfast for further medical examination in order to assess the degree of his injury. WBSS promoter Kalle Sauerland told reporters in the post-fight press conference that Burnett suffered a slipped disc in his back. After the third round, Burnett was heard telling his trainer Adam Booth: "I cannot move it. I cannot throw a shot." Burnett entered the WBSS as number one seed in the bantamweight tournament and he has not only lost his world title but also the chance to become undisputed world bantamweight champion. Former world cruiserweight champion Tony Bellew was quoted by BBC: "So sad to see Ryan Burnett leaving the ring like that. Donaire is a proper gentleman and a great fighter who wouldn't want to win like that. I just wish and hope for a speedy recovery for Ryan." Former British light-heavyweight champion Frank Buglioni symphatized with the Irish but appreciated The Filipino Flash: "Gutted for Burnett. He was looking fantastic. Sad ending to a great fight. Donaire showing real class with his compassion and lack of celebration." “I fear that the injury is not a good one, but I’m not a doctor,” Sauerland told Boxing Scene. “I heard he had a similar injury when he was a kid, but I don’t know. It’s up to him and his team to come out and make a statement on that."